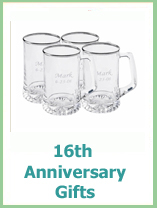 Check out the complete modern wedding anniversary gift list and you will find some great suggestions for your 16th to 19th anniversaries, which is a good thing as these years are not on the traditional list! Thankfully in modern times we celebrate more! Your 16th anniversary is celebrated from the modern list with silver, something that you might normally associate with a 25th. We have put together some ideas for this young silver anniversary to help you find the perfect gift. 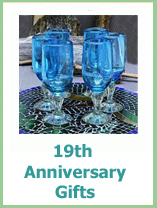 And your 16th anniversary is also celebrated on the gemstone anniversary list with Peridot. Peridot has been popular for thousands of years and even Cleopatra is thought to have worn them. Napolean also bought Josephine Peridot as a symbol of undying love. It is thought that wearing the stone will bring the wearer success, peace, good luck, lightness and beauty. Not bad for a yellow-green stone! 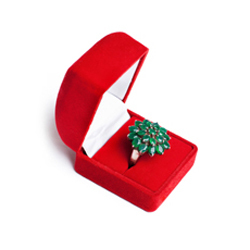 If you are celebrating your 17th wedding anniversary the modern gift list suggests furniture! Whether you are looking for a new table or not we have put some alternative ideas for your 17th that still fit the theme. 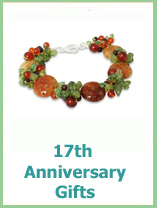 There is also the gemstone anniversary list where your 17th anniversary is celebrated with Carnelian. It is a reddish, orange stone and it has been used for thousands of years. The Ancient Egyptians believed it protected in the afterlife it was known as Thet, Buddhists from China, India and Nepal made it into amulets as they believed it had powers of protection. It also appears in Hebrew and Hindu history. Folklore believe it gives your energy a boost and helps with a sense of humor - good qualities when it comes to 17 years of marriage! 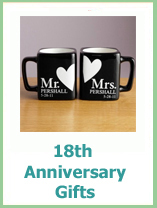 Your 18th wedding anniversary is celebrated with porcelain, this doesn't have to be an old fashioned ornament, there are some great porcelain gifts. Practical and decorative, plus ideas to suit all budgets, have a look at our suggestions. Your 18th is also celebrated on the gemstone list with Chrysoprase. Chrysoprase is a lovely deep apple green color and has been mistaken for imperial Jade in the past. It's history dates back to the Romans, Ancient Greeks and Egyptians where it was used for jewelry. 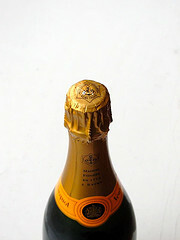 It is said to bring hope and joy and quite a few other pleasures too. Your 19th wedding anniversary is celebrated with Bronze, we have put together ideas from the traditional bronze garden statues to bronze colored gifts to help you find the best gift for you. Your 19th is also on the gemstone list with Aquamarine, a beautiful turquoise stone that is thought to protect you on water. Sailors would sleep with aquarmarine whilst at sea, and folklore believes that mermaids tails were made from Aquamarine. If you are planning on travelling over sea or a cruise for this anniversary you may want to take some with you! Have a great teenager anniversary, don't forget to let us know what you got up to via our contact page!